Magic Love Classic Slot Guide & Review - Casino Answers! 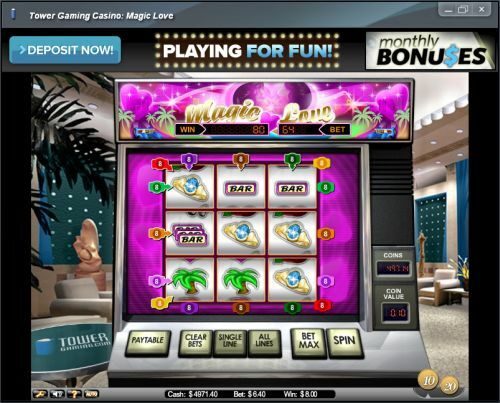 Magic Love is a 9-reel, 8-line classic slot machine developed by Net Entertainment. You can play the Magic Love 8-line slot machine at Bovada. Coin values on the Magic Love slot machine are $0.10 and $0.20. You can select from 1-8 lines. Each position on the Magic Love slot game is its own reel, thus the slot is a 9-reel slot machine rather than a 3-reel slot machine. You can bet anywhere from a dime per spin up to maximum bet of $12.80 per spin. Magic Love is ideal for casual slots players rather than high rollers. You can play up to 1000 autoplay spins. To play Magic Love, hit the “Spin” button or to play all 8-lines, use the “Bet Max” button. The highest paying symbol on the Magic Love slot machine is the Car symbol. If 9 Car symbols cover all of the reels of the Magic Love slot game, you will win the 2000 coin top jackpot. The highest single line payout is 300 coins for 3 Car symbols. If you hit one of these jackpots, you can win a lot of cash when you play the Magic Love 8-line slot game at Bovada! There are 12 regular winning combinations on the Magic Love classic slot machine. The regular payout schedule is as follows (payouts in parenthesis): 1 Champagne symbol (2), 2 Champagne symbols (4), 3 Champagne symbols (8), 3 of any Bar symbols (8), 3 Ring symbols (10), 3 Rose symbols (12), 3 Palm Tree symbols (14), 3 Heart symbols (20), 3 Single Bar symbols (40), 3 Double Bar symbols (100), 3 Triple Bar symbols (200) and 3 Car symbols (300). Magic Love has an autoplay mode that can be opened up by hitting the “Auto” button. You can play 10, 25, 50, 75, 100, 250, 500, 750 or 1000 autoplay spins at a time. In the advanced settings, you can set Magic Love autoplay mode to stop on any win, if free spins is triggered, if the jackpot is won, if a single win exceeds (any amount you input) and if cash increases/decreases by (any amount you input). You can stop the autoplay mode at anytime on the Magic Love online slot. Magic Love is a unique slot machine with an interesting payout structure. If it’s Valentine’s Day or if you’re just in the mood for some love, you can play the Magic Love slot machine at Bovada. You can play the Magic Love Flash game for free at Tower Gaming Casino. You can play for free or real money. If you experience any difficulties with the Flash software, make sure you’re using the latest version of Adobe Flash Player. If I have a Macintosh, where can I play the Magic Love online slot? 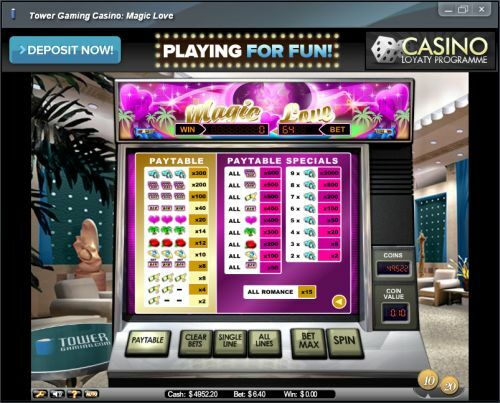 Mac users should also head over to Tower Gaming Casino to play the Magic Love slot game. For more on Tower Gaming Casino, please read our Tower Casino Review. Where can I read other 8-line slot reviews? For other 8-line slots, please read our Chinese Kitchen, Ultimate Fighters and Sweet Thing slot reviews.